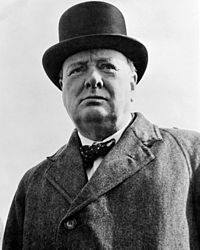 Sir Winston Leonard Spencer Churchill (November 30, 1874 – January 24, 1965) was a British politician known chiefly for his leadership of the United Kingdom during World War II. He served as Prime Minister of the United Kingdom from 1940 to 1945 and again from 1951 to 1955. A noted statesman and orator, Churchill was also an officer in the British Army, a historical writer, and an artist. Churchill giving his famous 'V' sign. from left to right: Winston Spencer Churchill, Judd Dunning Blick, John Charles Blick, Frederick Russell Burnham, and the Earl of Kent, (Egypt). Acme. Old Friends Get Together, 1951 The leaders of NATO's newly created military arm, the Allied Command Europe, were taken from the ranks of the coalition that had won World War II in the west. The first Supreme Allied Commander, Europe, was American General Dwight D. Eisenhower; his British Deputy was Field Marshal Bernard Law Montgomery. They are shown here at a reunion of the British Eighth Army on October 19, 1951. Churchill, leaning across a seemingly disgruntled Eisenhower, would again become Britain's Prime Minister five days later. Cartoon from Punch magazine, 14th January 1914, referring to the approbation of Churchill's erstwhile Conservative Party colleagues to his proposals for funding the navy; and invoking the song You made me love you popularised in a 1913 Al Jolson recording. Winston Churchill near British Embassy Washington, D.C.